Timmy Hill at Charlotte Motor Speedway in North Carolina in May of 2018. The era of the Zombie Dodge, which long outlived its planned exit from the NASCAR Xfinity Series after Dodge left the sport six years ago, ends along with the NASCAR season this weekend. When NASCAR starts back up in February, the car won’t be legal—killing, for good, the one car that refused to truly die. Dodge officially pulled out of NASCAR’s three national series right after it won the 2012 drivers’ title with Brad Keselowski in the top-level Monster Energy NASCAR Cup Series. Keselowski’s Penske Racing team announced it was moving to Ford the next season, and without another major team to pick Dodge up, the company ducked out before the 2013 race season began. The Cup Series got a new body style in 2013, meaning Dodge never got to race the Charger it made for that Cup Series season. But there were still old Dodges in the two lower levels of NASCAR, like the Xfinity Series’ Dodge Challenger models. NASCAR kept the inspection templates around for the cars in the lower levels, but not the Cup Series, since the new car never competed in it. But like the Cup Series did, and like we all do, the Xfinity Series is moving on next year. NASCAR’s moving from steel to composite bodies in the series next year, which essentially means body panels on the composite cars can to lock and bolt on rather than be welded onto the chassis like steel ones were. The Dodges are steel, and allowed this year. They’re out of the picture next year. This fact was easy to forget, since it’s a rule change that doesn’t change much for a viewer. But Xfinity Series race team MBM Motorsports and Yahoo Sports reminded us that NASCAR’s season finale this weekend is the last ride of the steel bodies, and the last ride of the Zombie Dodges—a fun symbol of an era that ended years ago, and a reminder that some race teams at the top levels of NASCAR have to get creative in order to compete. 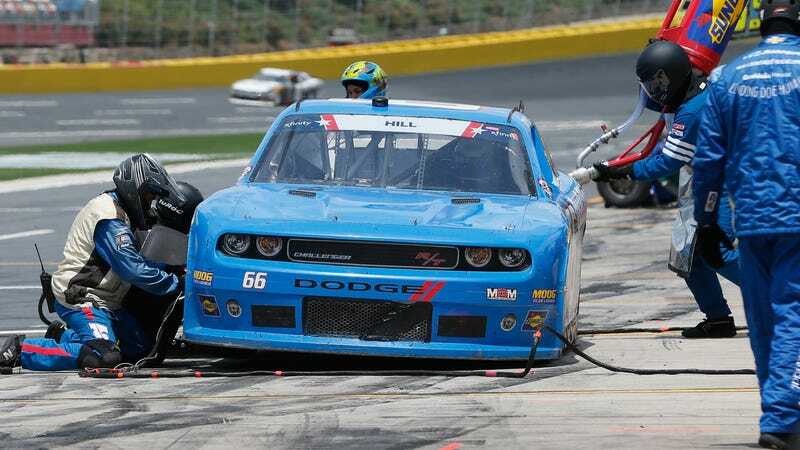 This is just the end for the Dodges in the Xfinity Series, though, and MBM Motorsports said on Twitter that it’ll sell the cars after the season ends. But the saga of the Zombie Dodges was a full, wonderful six years. Fiat Chrysler gave no factory support to race teams still running its cars after the company pulled out, and teams like MBM Motorsports sought out deals on old cars that bigger teams like Penske weren’t using anymore. While the other race cars continued to develop in the series, the Challengers in NASCAR were just like they were in 2012, no matter what calendar year it was. They had restrictions in performance and aerodynamics as the years went on and other cars evolved, like we talked about in this story. But seeing them in the field at tracks where aerodynamics mattered less was like seeing an old friend. But that old friend is leaving in just a few days, likely never to run in a NASCAR national series again. The only good outcome here is that they’ll be for sale. Goodbye, Zombie Dodge. We really did know you, and that’s the hardest part.